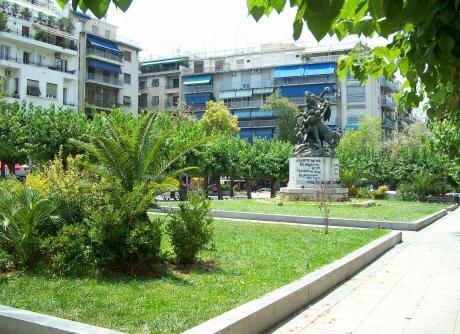 The transformation of Victoria Square in Athens is emblematic of the new model of top-down control of populations that Europe is moving towards. Victoria Square, Athens. Wikimedia/Badseed. Creative commons.For a split second the setting - in which the action unfolding before my eyes - feels entirely unfamiliar. There I am, standing in the middle of one of the busiest streets surrounding Victoria square, an area that I would consider to know well enough. But this is all too baffling: The hustling and bustling in front of me takes place in immaculate English - the employees of an about-to-open Salvation Army thrift shop unloading the merchandise as they prepare for their launch. Down the road, the swarming vests of international NGOs gather around a newly opened, upmarket falafel shop ― and as I cross the street, what appear to be two international journalists negotiate with their fixer where they will take them to shoot and interview next. Whatever happened to the square that used to be here? Victoria was one of those magical spaces in Athens thriving in their anonymity, a site transient for all and therefore oddly egalitarian in the way in which it allowed pretty much everyone to use its space. Victoria, not least thanks to the sheltering of Villa Amalias, the now evicted squat down the road by Heyden Street, largely dodged the wave of fascist and racist attacks that had become something of a lethal habit in those very dark years of the not-at-all distant past. And then, the Villa Amalias eviction had little of an effect upon the way in which the streets were populated; the anarchists never left, nor did the assemblies of solidarity ensuring this was to remain a proudly mixed space of cohabitation skilfully flying below the radar of vile racism or police repression. If there was one thing that made Victoria feel the most unfamiliar that day, it was exactly to see it bathed in the light of international media and NGO attention. Like a war site minus the visibly dead and injured, the streets of Athens seem to swiftly turn into the veins through which the medicine injected for the coming together of the European body is meant to run through. Not at all unlike the FRONTEX circumventing and cutting those in solidarity out of the refugee arrival process, the Victoria transformation bears a clear enough message to those who would wish to support the incoming refugees and migrants on the everyday level: there's nothing for you to see here, move on. The site of their arrival is treated as something not at all dissimilar to a crime scene, where only the experts, the authorities and those accredited by them may have access to. What is the meaning of this? In one sense, it is a reflection and projection on the level of the street of a process that sees the rapid imposition of a very specific understanding of “Europe” and the way in which the continent is to function. Together, but by no means anything close to egalitarian: if this is the new European body, its head is clearly in the north, its limbs in the south: numb in face of the unfolding irruption, if not outright inoperable. Make way for the pros, shouts out this NGO colonisation of Victoria. And the ensuing morale is one that places not just the professionals over the well-meant amateurs; it positions the well-funded, fully governmentally accountable organisations over and above the grassroots groups that have been humanising the refugee journey all along into this crisis. Victoria found itself acting as a proxy host of the middle eastern war crisis. And now, in this cross-border permeation of governance and control, the small, bustling square is turning into the site par excellence for the management-by-proxy of the newly arrived populations. What plays out in the streets of Athens is little other than one of the earliest, crudest steps toward European integration in its most relentless of forms: a sweeping, managerial imposition of a top-down logic of control that commences from the newly arrived populations and seeps into the details of our everyday experience, into the innermost folds of our lives.